The fourteen (14) day notice to quit is a document that gives a tenant the option to comply with a violation against their lease, usually paying rent late, or leave the property with all their possessions. If they decide to leave, they will be liable for the amount not paid along with any other obligations in their rental contract with the landlord. Although, if the tenant corrects the violation their lease will be back in compliance as if the infraction never happened. Nevertheless, some States have conditions that if the tenant violates their lease more than once in a certain time period the landlord has the option to terminate the agreement. The notice available on this page can be viewed using the preview image. Once you are ready, select the file type you wish to work with (PDF, Word, ODT) by clicking on the appropriately labeled button or link above. Gather your references then open this template on your machine. Ideally, you will have software compatible with the version you have downloaded. IF so, you may enter the information directly onscreen. In the absence of such software, you can access the PDF version using an up-to-date browser then print it. If filling it out by hand, it is recommended, you use blue or black ink. The first blank line of this document (after the word “To”) is reserved for the name of each Tenant listed on the concerned lease. Refer to the lease that has been violated then, record the name of every Tenant who has signed it on this line along with every Subtenant involved. Make sure each name reported appears exactly as it does on the lease in violation and (if applicable) the relevant sublease agreement. The first paragraph will contain several blank lines that require some information input. Here, we will report the physical address of the property being rented through the lease that has been violated by the Tenants listed above. Begin by entering the name of the City where the property is located on the blank line after the words “City Of.” Next, record the county, state, and zip code where the rented property is found on the blank lines following the terms “County Of,” “State Of,” and “Zip Code” (respectively). The next two lines will require we are more specific. Thus, locate the building number, street name, and apartment number listed on the violated agreement. Use the space after the phrase “…Number And Street As” to present the building number and street name/number of the rented property as it is reported on the lease. If the rental property has a unit, suite, or apartment number it should be documented on the blank space after the word “Apt.” Now that we have documented the Tenants and the rental property being focused on, we should identify the lease that has been violated. We will do this by reporting the signature date of the Tenant on the rental agreement as well as the location where this lease applies. Use the first, second, and third empty spaces following the term “In Accordance With Your Lease…” to document the two-digit calendar day, month name, and four-digit calendar year when the Tenant signed the lease. On the space just after the phrase “State Of,” fill in the name of the state where the violated lease is governed. Oftentimes, this information is found in the “Governance” section of a lease. The language supplied in this paperwork will make sure that its recipients will understand they have fourteen days to obey the statement you select below the bold words “Within Fourteen (14) Days.” You should select one of the three statements in this area by marking the corresponding checkbox then filling in the information appropriate to the blank lines in your selection. If the purpose of this notice is to seek payment for past due rent, then mark the first checkbox statement. This statement requires the Tenant to pay the total due amount to the Landlord signing this notice or to an individual you name on the first blank line. If you have selected the first statement, then you will also need to write out the full amount owed on the second blank line and enter it numerically on the blank line in the parentheses. This first selection will contain a statement in bold. Locate the first blank line, then supply the amount the rent amount the Tenant did not pay on the first blank line. Use the next two blank lines to report the first month and year of missed rent and the last two blank spaces to record the last month and year the Tenant owes. If the Tenant is guilty of a lease violation and will be given fourteen days to correct the problem or violation, then mark the second checkbox. When selecting this statement, you must locate the blank line following the phrase “…The Violation Described As then supply a detail of the way the Tenant has violated the agreement. If applicable, you may also insist on a remedy. If you are working on paper and require more room, then make sure to supply this information on an attachment and cite the attachment in this area. Any such attachment should label, dated, and signed. 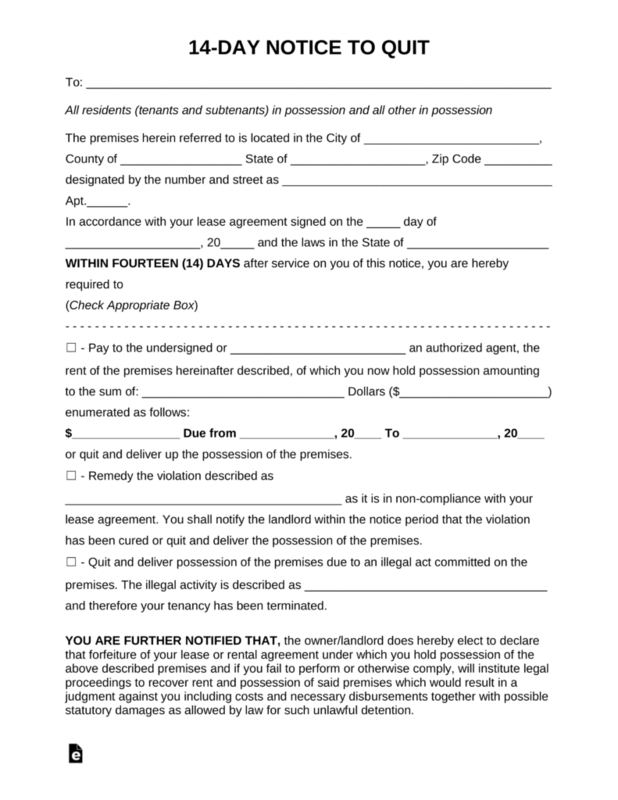 If this notice is being produced because the Tenant has committed an illegal act and must surrender the property within fourteen days, then mark the third checkbox and describe the illegal activity on the blank line provided. The remainder of this document will present some additional language required for its purpose. 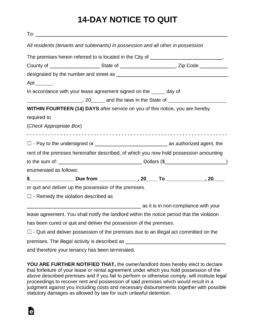 The Landlord, Property Manager, or Rental Agent issuing this paperwork should look for the blank line “Landlord/Agent Signature” then sign his or her name on it. In order for this paperwork to fulfill its goal, its delivery will need to be verified. An additional page, “Certificate Of Service,” has been provided for this purpose. This page is for the use of the agent delivering this paperwork. He or she should record the day a successful delivery was made by entering this date’s calendar day on the first blank space, month name on the second blank line, and year on the third blank line. The name of the individual who received this paperwork should be presented on the space following the date reported above. The Agent who delivered this document should indicate how this act was completed. This can be done by marking one of the checkbox statements provided. The first statement will define delivery as being made personally to the intended recipient, the second statement will define the delivery as personally given to an adult member of the recipient’s household or co-worker, while the third checkbox will indicate delivery was made using first class mail addressed to the recipient. Only one of these statements should be marked. The Agent must sign his or her name on the “Signature” line after filling out this page.